The effort by the giant nuclear utility to get Ohio legislators to create new regulations enacting zero emission credits (ZEC) for the Davis-Besse and Perry nuclear power plants has stalled out according to news media reports. Over the past year Ohio state legislators in both the House and Senate have held multiple hearings on the request by First Energy to put its nuclear power plants under a regulated regime to give them credit for not emitting CO2. If enacted the new arrangement could produce more than $300M/year for the financially troubled firm. Legislative leaders in both chambers have made it clear that despite hearing hours of testimony they are in no mood to call for a vote either to bring a measure to the floor or ask for a full vote on such a measure. Neither committee considering the legislation in either the House or Senate reached a conclusion. With other legislative matters pending it could be that any further consideration of the proposal could be put off until Fall 2017. In an effort to broaden the basis for the ZEC legislation, on June 1 Exelon Corp VP for government affairs Joseph Dominguez said in testimony to the Ohio Senate’s Public Utilities Committee that six nuclear reactors in five states have shut down and another seven nuclear reactors will shut down prematurely by 2019, because electricity markets are not properly valuing the benefits that baseload electricity power plants provide. “These markets do not address many environmental externalities, the need for fuel diversity, or concerns about grid resiliency arising from terrorism or operational catastrophes that threaten the natural gas infrastructure system that supplies gas-fired power plants. As a consequence, traditional baseload resources are not valued for their contribution to fuel-mix diversity or for the increased resiliency they provide by virtue of having a 30-day supply of fuel at the plant,” Dominguez said. The key reason that legislators in the House and Senate are gun shy about calling for a vote is not that they don’t understand the issue. What has then frozen in their tracks is the intensity of the opposition. AARP reminded the legislature that it has 1.54 million members in Ohio and that the over 50 crowd votes out of proportion to its numbers compared to other age cohorts. Absent First Energy making good on its threat to close the reactors if it does not get ZECs, the legislature’s response to this kind of opposition is to bottle up the proposal without reporting it out of committee. In Fall 2016 First Energy said it would get out of the business of competing for market share for electricity generated by the reactors within 18 months. That puts the deadline in late winter 2018. For 2016 First Energy (NYSE:FE) recorded a loss of $14.50/share. The firm was profitable for the three years prior to 2016 recording earnings of $1.36/share in 2015. The company paid dividends of $1.44/share for the past four years. The stock price has not been particularly volatile over the past year, but has recorded a downward trend from a 52-week high of $36.51/share in July 2016. Market close on June 9, 2017, was $29.11 and the 52 week low was just slightly below that at $27.93. The market cap is $13 billion with 444 million shares outstanding. First Energy’s reactors – Davis-Besse located near Toledo and Perry located northeast of Cleveland – operate at a disadvantage in bidding wars for power in highly competitive wholesale electricity markets. 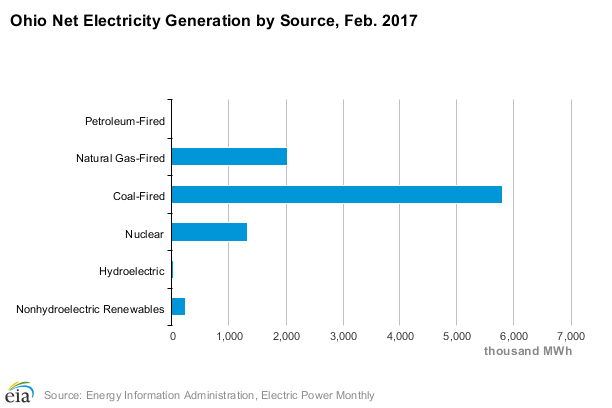 Companies that sell power in these markets get it from natural gas turbine plants that generate power at about half the cost of getting the power from nuclear reactors. The utility has threatened to close the two reactors if the change to authorize ZECs is not made. The firm has also threatened to file for bankruptcy though it has not formally filed any paperwork with a court. State legislators complain that they get a case of cogitative dissonance about First Energy’s request for higher rates for power from nuclear plants. The utility fought air pollution rules for years, but now wants financial support for its plants that don’t emit CO2. If granted, ZEC would take money from rate payers in proportion to the amount of CO2 emissions avoiding by keeping the nuclear plants open. According to the legislative proposal, the utility would get a zero emission credit, or ZEC, of about $17 for every ton of CO2 the nuclear reactors do not produce for the equivalent amount of electricity if generated by a coal fired power plant. For instance, the Gavin coal plant located in Cheshire, OH, which was operated by the American Electric Power Co., emits 18.7 million tons of CO2 per year. The plant produces 2600 MW of electricity a year. Note: In January 2016 American Electric Power sold the Gavin coal plant and three others, for a total of 5200 MW, to Lightstone Generation LLC, a joint venture of Blackstone (NYSE: BX) and an affiliate of ArcLight Capital Partners LLC (ArcLight), for approximately $2.1 billion. The two First Energy nuclear plants produce a combined 2128 MW of ZEC power (Davis Bess 900 MW, Perry 1269 MW). That’s 81.8% of the power produced by Gavin which would be equal to 15.3 million tons of CO2 in a year. The ZEC for First Energy, based on this hypothetical comparison, would be equal to $260.2 million. The actual rate case would be a good deal more complicated but this example illustrates how the system would work in principle. Residential customers might not feel much of a bite from this system, but industrial users of electrical power could see significant increases in their costs. The bottom line is no one wants to pay for reductions of CO2 emissions. For the moment there isn’t much of a threat that First Energy will close the reactors even if they don’t see legislative progress this year. 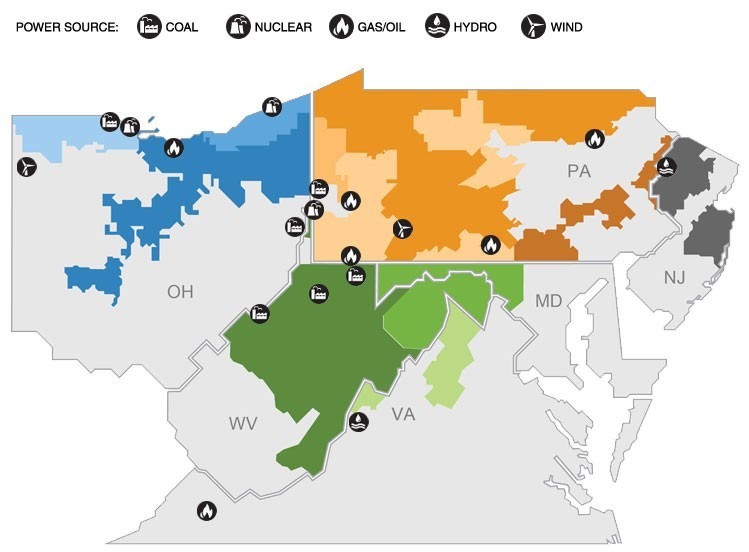 A recent auction for power to be delivered in 2020, run by the PJM Interconnection firm that operates the high voltage wholesale grid in the Midwest, included the two plants. By making commitments to provide power First Energy gets cash from PJM whether it buys the power or not. What First Energy must do when called on is to provide the power when other plants go offline. The success with the PJM auction means First Energy has an incentive to keep the reactors running through May of 2021. However, managers of the PJM have rejected First Energy’s claims that the Davis-Besse and Perry reactors are needed to keep the grid stable. The NRC license for Davis-Besse was renewed for 20 years in December 2015. The current NRC license for the Perry Plant is good until 2026. 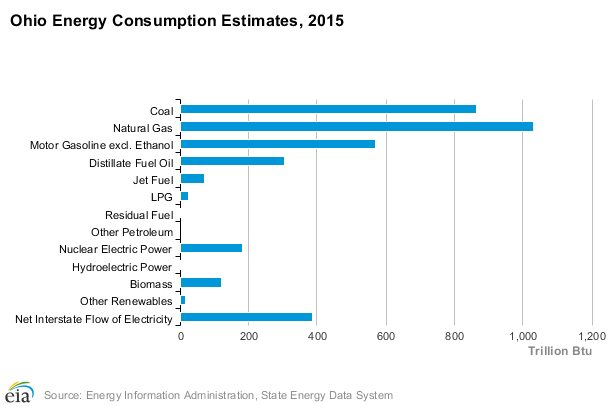 First Energy is not exclusively a nuclear utility. It operates coal and gas plants, as well as nuclear, in six states. What’s interesting about Ohio is that the largest segment of the state within the state is serviced by gas plants. Taken together the two reactors provide about 14 percent of the electricity used in Ohio. See map below of service areas and links to generation facilities. The eastern end of the state is a hotbed of natural gas production based on fracking and the state has a long history as a major coal producer. 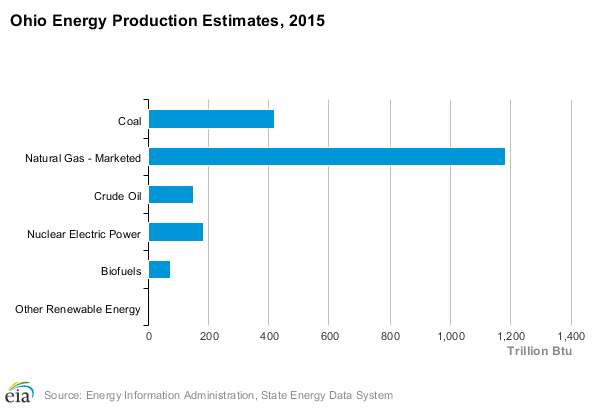 The renewable energy sector is so small in terms of production that it barely registers on the chart below. Requests by wind and solar energy producers for ZECs would have an even harder time with the legislature than nuclear.